Most people don’t realize that the primary difference between a true brown whiskey and a traditional moonshine is that the whiskey is aged. 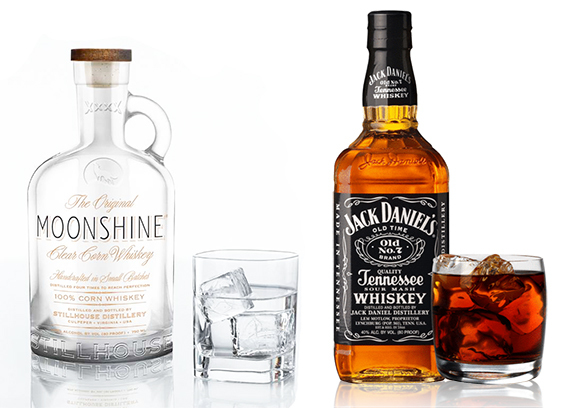 Technically, though, in the instance of Jack Daniel’s the grain alcohol produced by a mash of corn, rye and barley malt is first filtered by charcoal to “mellow” it out — there is no mellowing process for moonshine. Then it’s aged in charred oak barrels, which gives it the distinctive orange-brown color and a signature whiskey taste. See Jack Daniel’s process here. There, you just learned something new for the day.